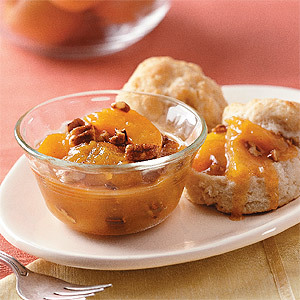 Both sweet and tart, our Fresh Apricot Praline Butter is better than any jelly you could ever plop atop a biscuit. Plus, you can make it ahead, and keep it in the fridge for using just like jams or jellies on other breakfast breads. Melt butter in a sauté pan over medium heat. Add apricots and cook, stirring occasionally until softened, about 5 minutes. Stir preserves and brown sugar into apricots and butter until melted; add vanilla and cinnamon. Bring mixture to a boil, and boil without stirring 3–5 minutes. Off heat, whisk in cream (the mixture will sputter) and rum, then add pecans. After the apricots have cooked down a bit, stir in the preserves and brown sugar until melted.